Bright green and orange labeling jumps out at me as I stand in the middle of the grocery aisle. “Locally-sourced,” one section of produce shouts. “Heart healthy,” boasts another, adding to my confusion. My newly-rekindled resolution to switch to a healthy diet is already beginning to feel like a burden. Neither option looks appetizing. Companies often place brand and labeling information on the front of packages specifically to grab your attention and get you to buy their product over any others. This makes sense, because the faster a particular type of food catches your eye, the more likely you are to focus on it and eventually purchase it. But you pick up more information from how the food is packaged or labeled than you realize. Those cues can bias your decision not only about whether to purchase a product, but also about how healthy, fresh or tasty it is. Psychological and linguistic theories closely link language-based information processing, such as from a box of juicy red strawberries, to what you think about the package carrying such information. This suggests that food labels provide input that we use to make a deliberate, conscious decision. Indeed, health policy strategies, such as calorie-labeling, tacitly adopt this view. But local food labels are newer and not as well-defined as standard calorie labels or even certified-organic items. Yet, so-called local food seems to be popping up everywhere, making me wonder whether local food is really something I should be eating more of as part of an effort to live a healthier lifestyle. More and more consumers — including myself — have become interested in local food because it’s a catchphrase that has come to encapsulate a number of healthy lifestyle and economic ideals. Some people want to eat local food because it honors a direct relationship with the farmers producing the food we eat that is otherwise unattainable in the age of industrialization. Others eat local food because they believe it reflects a more sustainable system of food and farming practices, and is therefore better for the environment. Still others eat local food because they feel it must be fresher and more nutritious by virtue of the shorter distance the food travels from the farm to your table. But any $11 billion-a-year industry should be approached with caution. The wholesome-sounding “local” label still remains squarely on the fence between health and marketing. Part of the reason for this misunderstanding is a phenomenon psychologists call “sensation transfer.” This is when printed or otherwise overtly eye-catching information, such as packaging, branding and labeling, significantly alters our experience of food and drink. It is the pull of supposed wholesomeness or the expectation of tastiness that a simple word like “crispy” can elicit. Companies often use this phenomenon to lure you into buying their product. And it’s not limited to pre-prepared or packaged foods. Eggs that are labeled as being local, for example, will seem healthier than other non-labeled types. And locally-caught salmon at your farm-to-table restaurant will probably sound tastier than any other, non-local dish. Companies can easily take advantage of the fact that there is no standard definition of what local really is. While the USDA recommends that local food be produced and sold with a 400-mile radius, the recommendation is not enforced. “Local is very much whatever people want it to be,” says Michaela Tarr Oldfield, a food law professor at Michigan State University. The “local” granola or fruits I buy at the grocery store could have been produced within 50 miles or 150 miles of where I live. It’s up to individual organizations or retailers to pick and choose which definition they use. Walmart, for example, defines “local” as being within the same state, which means that something grown in Buffalo could be sold as “local” in Brooklyn. Health food giant, Whole Foods, however, sticks to a 100-mile rule. 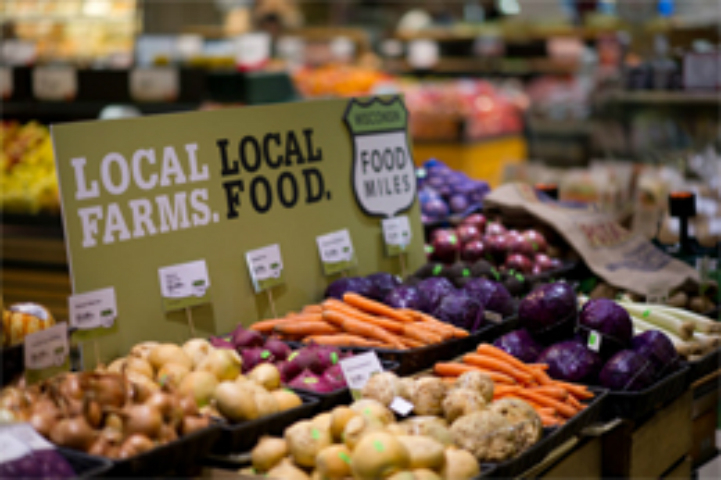 Other grocery store chains may even consider “local” as being from the same region, like from the Great Lakes region, or the New England region. In some markets it may not even be practical to stick to a rigid distance-based definition. “What seems local in New England may not be realistic in West Texas,” says John-Mark Hack, the secretary of the board of the Local Food Association, a nonprofit supporting small farms and local food systems across the United States. Sometimes, the climate and geography of a place simply aren’t feasible for growing some produce. And I don’t think I should stop eating bananas because they aren’t grown locally in New York, where I live. Another misconception that adds to the confusion about local foods is that it is safe and that it does not involve the use of pesticides. Yet that is not always the case either. Many farmers and local food manufacturers rely upon some use of chemicals or additives in the foods they produce. They may not be the same pesticides or at least not the same amounts of chemicals that conventional farming practices require but the food is probably not completely pesticide-free, even if it was grown a mere 10 miles away. This is true for meat and eggs, too. Local does not always mean healthy, organic or cruelty-free, says Oldfield. Consumers shouldn’t blindly trust food labels at the grocery store or even the local restaurant. If eating locally is important to a consumer, they should ask more questions about it and try to make sure the food system is as transparent as possible, says Craig Chase, who studies agriculture and food management at Iowa State University. In the end, eating local food is a personal choice. But it may not necessarily make you healthier, solve a food crisis or ensure environmentally-friendly farming practices. It is simply another option. So I won’t be going out of my way just to find a farmers market when I need to buy groceries again.